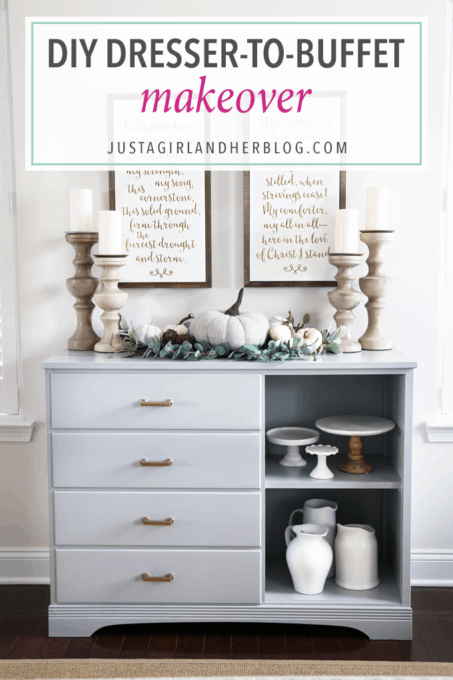 We turned an old dresser into the perfect sideboard buffet for our dining room in this simple painted furniture makeover! Ever since we moved into our house over a year ago, I have been on the hunt for a sideboard / buffet for our dining room. The space under the canvases on the far wall always looked so bare to me, and I just knew that it needed a little something. The problem was, the space between the windows was a weird size. It was too small for most traditional buffet pieces that I was coming across, but too wide for more of a vertical “cabinet” type piece. Along with the size issue, I was being kind of picky about what I wanted out of the cabinet. 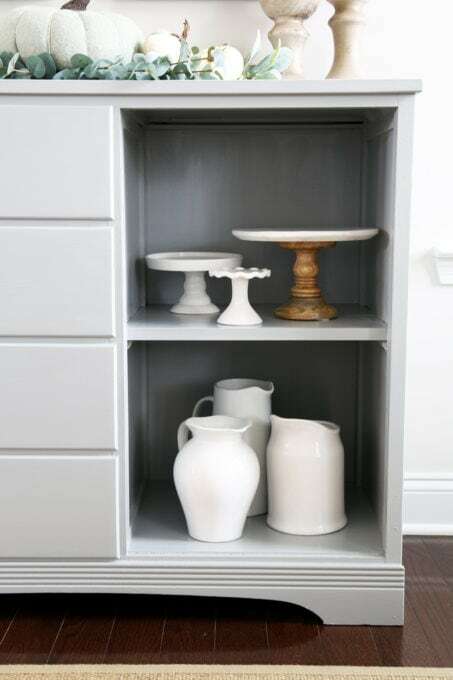 I wanted some hidden storage (preferably drawers) where I could store table linens like napkins, tablecloths, and runners, so the cabinet couldn’t have all glass fronts. But I also thought it would be fun to have a little bit of open shelving where I could create a little display, and the combination was tough to come by. I grabbed a measuring tape and took measurements, and sure enough it was the exact dimensions that I had been looking for for over a year. And it had the drawer space I wanted. And maybe there was a way to create an open shelf. And it had been sitting there in front of my face the whole time. Since the dresser was a little small for the boys to be sharing, I convinced Donnie that we should get them a bigger dresser, and I stole the old one for the dining room! 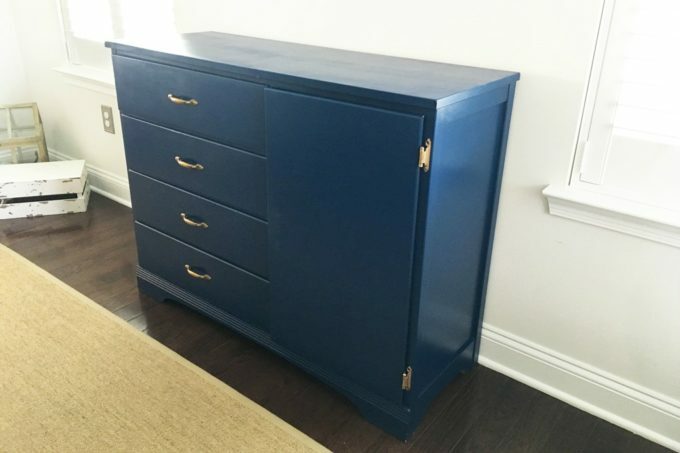 I loved the blue color of this piece when it was a dresser for the boys’ room, but in the dining room, it wasn’t a great fit, so I knew I wanted to paint it. I used Donnie’s sander to rough up the shiny finish a bit first so that the paint would have a solid surface to adhere to. We had just painted Donnie’s office a beautiful gray color called Chain Reaction by Behr and we still had some paint left over, so I just decided to use that for this piece. The shelf, which I thought was going to be really simple, ended up being a bit trickier. This piece was a thrift store find, so it is older and doesn’t have perfect angles. When Donnie first cut a board for the shelf that he thought would work, we realized that the spot was sort of warped; it was narrower in the back than it was in the front. The easiest solution he found was to use a few trim pieces we had leftover from the trim work in our kitchen and put them together to create the shelf. This way, he could make them each the correct length we needed for the different sizes within the space. Once we figured out the shelf issue, I finished up the painting and added a few coats of polycrylic to protect the piece from chipping. I then added the hardware, and I was done! I always love when a piece is really functional for storage but also can be a beautiful display at the same time! I am always on the lookout for inexpensive greenery because it makes it really easy to pull together a quick (and pretty!) centerpiece! Target’s Dollar spot will have faux greenery from time to time, and Michael’s and Hobby Lobby both have their greenery at 50% off (or more) sometimes, so I always stock up then. I love the addition of this piece to our dining room! I think it makes the room feel less empty and more welcoming. We still have several more projects to do in this space before we call it “finished,” but we are well on our way! 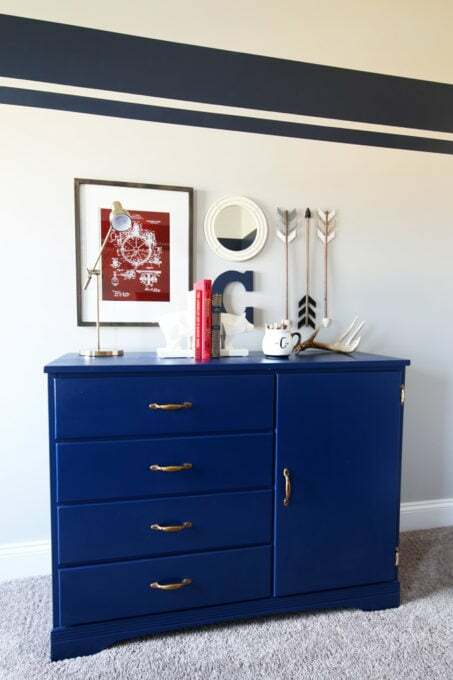 I liked this piece as a dresser in the boys’ room, but I also love that with a few tweaks, it can work well as a sideboard too! I spent about $16 on the hardware, but other than that, I used items I had on hand, so it was a really inexpensive project as well! Win! 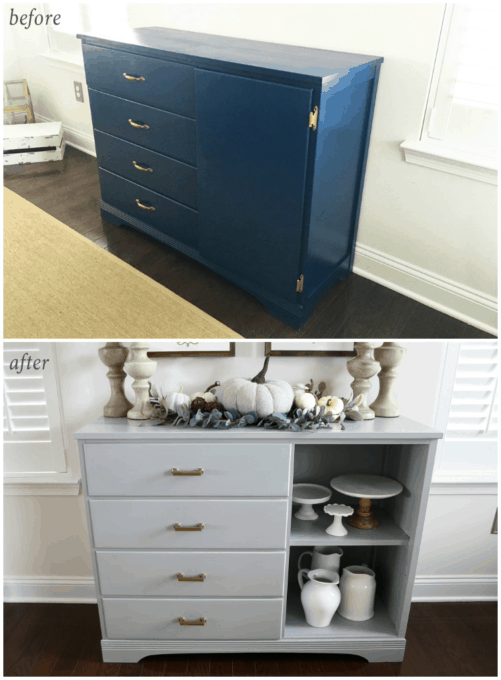 Have you done any fun furniture makeovers recently? I’d love to hear about them in the comments! I love this, but I am even more drawn to the song lyrics in the wall art Did you make that, too? I did! 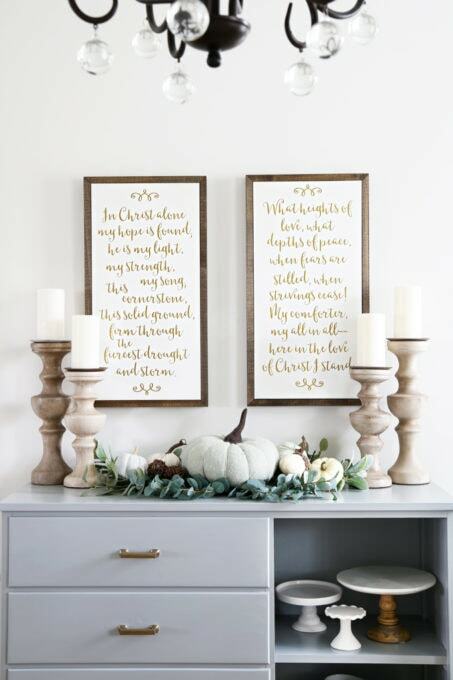 I made them the same way as I made the sign in this tutorial: https://justagirlandherblog.com/how-to-make-a-hand-lettered-sign/ . Thank you for your sweet words, Karen! Have a great day! Great new addition to your dining room, Abby! Way to shop your home! I myself have the double dresser from my parents’ first bedroom suite in the ’60s in my living room as a credenza. It is mid-century modern in design and all I did was repaint it as it was in very rough shape. I love it and it has so much storage in it. BTW, can I just say that I LOVE YOUR BLOG!!! Aw, thanks so much, Gwynne! You’re too sweet! Repurposing is the best, isn’t it? It makes me feel so accomplished! 🙂 Have a great week! This ROCKS, Abby! So perfect! I love the combination of storage and decor shelving… and you styled it SO nice! I loved that you repurposed something. It is funny how the best tools are already there. What a terrific idea. It looks great. I always enjoy your posts!!! Thanks so much, Beth! I was really excited with how it turned out! 🙂 Happy Monday! This is re-purposing at it;s finest! I loved how it looked in the boy’s room (I just love that room-period! ), but it fits in beautifully in the dining room ! And who doesn’t need more storage in the dining room? Thank you for walking us through the step-by-step — I will pin this for future reference when I am working on a project like this one! My parents found an old kids ikea table at a flea market for a few bucks and gave it to my daughter. It was an ugly boys blue color. I painted the chairs and legs of the table teal and the tabletop chalkboard black. She looooves it! It also fits in with the rest of our house decor so I love it. It looks beautiful! It’s very clean, simple and classic. 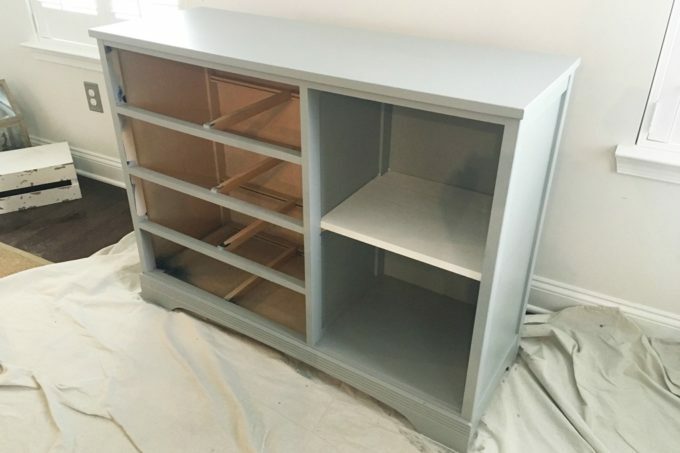 Who knew that your child’s dresser was just the ticket!? 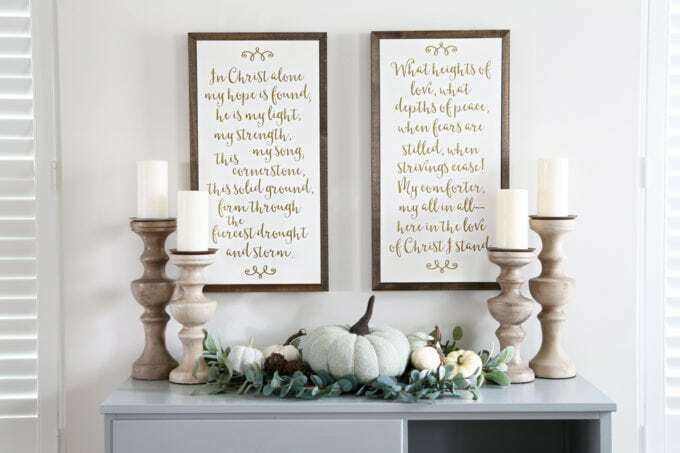 And I just love how you DIY-ed the framed lyrics to a hymn!!! Well done, Abby! Thanks so much, Andrea! It was unexpected but so excited with how it turned out! 🙂 Hope you have an awesome week! I love the makeover! I can’t believe you guys even removed the door and turned it into an open shelf! So gorgeous. It appears like Donny is super handy with those things. He made the deck table too, didn’t he? He is super handy which is amazing! He did build the deck table which is definitely one of my favorites of his projects. 🙂 Have a great week, Isabel! I love it and now this will be what I am going to do for my dining room too. 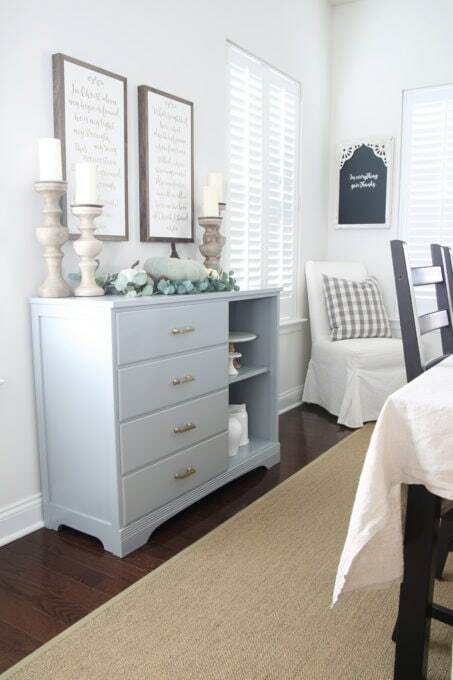 I will look for a dresser that has the right size drawers for placemats and table cloths, napkins etc and some open display area and as I have picture on the wall I need one that is no higher than the dining room chairs height. When my granddaughters outgrow the table and chair set then I will use that area for a new buffet. Thanks for the idea. 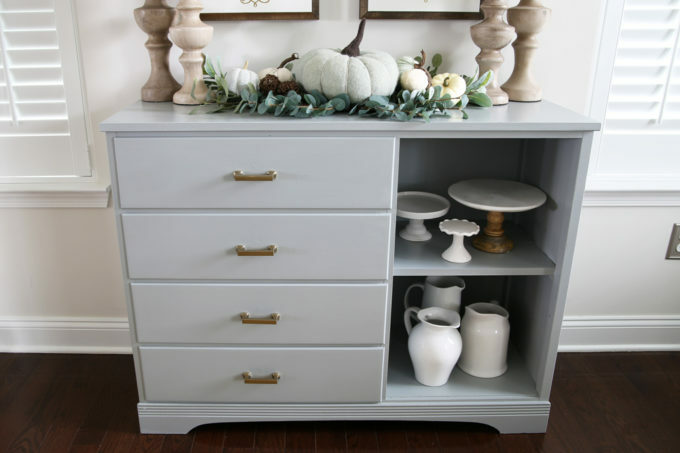 Thank you very much for sharing this DIY Sideboard Buffet! We’ve been having space issues as well, so this is definitely a big help for our planned room renovation soon! So glad it was helpful, Sam! Have a great weekend! 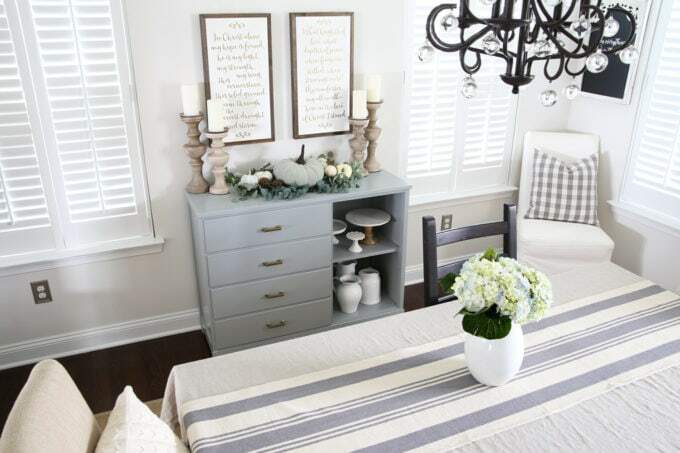 Your solution and upcycle was perfect for your space and you styled it so nicely. 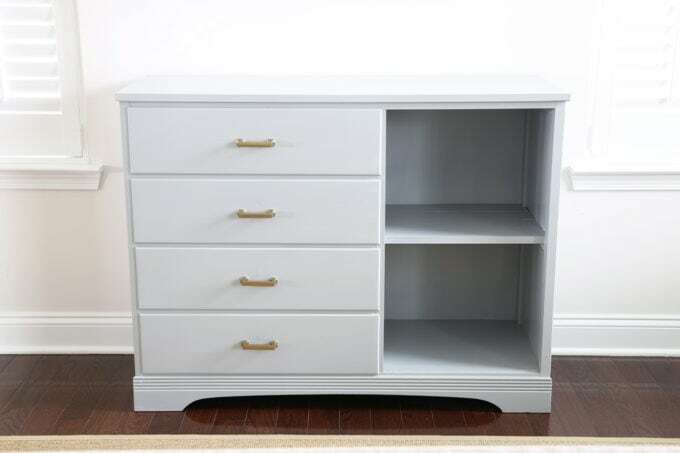 I have an old buffet (all drawers cuupboard doors) at the foot of my king sized bed for extra storage the room needs. The bench I had there before was kinda stylish but absolutely useless. Storage space is a good thing!